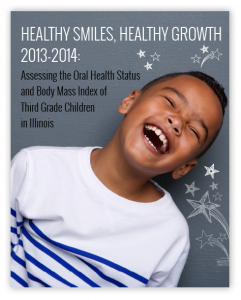 Our 2016 statewide oral health assessment (SOHA) found that the oral health of Illinois children is slowly improving. Approximately 22 percent of third-grade students have untreated tooth decay, down from 30 percent in the previous decade. While more children now have dental insurance, there are still significant disparities in the oral health status of certain population groups. Good oral health care is important for children. Poor oral health can lead to pain, missed school days, distracted learning, difficulty eating, poor nutrition, loss of social confidence, and in severe cases, even death. Healthy baby teeth also help properly guide adult teeth into alignment. In order to attend class, the state of Illinois requires dental exams for all kindergarten, second and sixth-grade children. The Illinois State Board of Education (ISBE) website contains information from every school in the state on the number of children receiving dental sealants, experiencing tooth decay and having untreated tooth decay. View this information by clicking on the links below. Heartland Alliance’s open-mouth survey compares the oral health status of Illinois third-grade children by income, insurance status, ethnicity and geographic region. Click here to view the report.